It's getting to that point in the Formula One season when things start to get serious. There are two championships up for grabs, and it's eyes down, concentrate to see who is going to win it. Here at Sidepodcast though, it's a different story, as we search for the lighter side of the sport. This week, there are points for drivers going head to head with their boss, taking on the team in a different game, and hitting the streets in a kart and a costume. Defending champion Ricciardo has a commanding hold on the lead at the moment, but Lewis Hamilton is making another charge and Fernando Alonso is coming under pressure once more. So exciting! +1 Pascal Wehrlein: Spot of water polo for the Sauber team, with some unorthodox moves from Pascal. +1 Pascal Wehrlein: Giving Vettel a lift after the race in Malaysia, and, it seems, prepping for a follow up career as a taxi driver! +2 Romain Grosjean: Sharing some insight from behind the scenes in Malaysia and admitting that he’d like to do more in the future. +1 Lewis Hamilton: Helping promote voting for Billy for the Laureus Awards. +1 Max Verstappen: Mini cakes! +4 Daniel Ricciardo: Incredible face to face Q&A with Speed Dial Daniel! Lots of fun! +4 Lewis Hamilton: Giving Brandon a great tour of the garage. +1 Daniel Ricciardo: Winning the cocktail competition against his teammate. 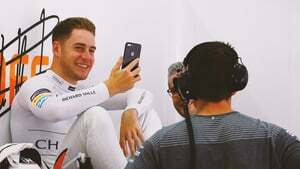 +2 Stoffel Vandoorne: Held his own well against his boss in this head to head quiz, with only one swear.